Would you travel 23 million miles to visit a rock? Probably not, but you're not NASA. Rocks are exactly the kinds of things that get the space agency going, and after today's extraordinary flyby of a very particular rock  known as comet Hartley 2  the scientists are awfully glad they made the trip. For all their visual flair, comets are extraordinarily mundane things  clusters of rock and ice left over from the primordial days of the solar system. There is a vast belt of the ancient objects beyond the orbits of Neptune and Pluto and every now and then one of them gets knocked onto an irregular trajectory, falling in toward the sun and soaring back out again in orbits that can play out over decades or centuries. When one of these rogues whizzes by, it is visiting not just from the farthest reaches of the solar system, but from the furthest reaches of time  a 4.5 billion-year-old scrap of the solar system's original raw material. For that reason, scientists have always been interested in getting as close to comets as they possibly can. Thursday's flyby, executed by NASA's Deep Impact spacecraft  an SUV-size vehicle launched from Earth in January 2005  is not the first time a probe has encountered a comet. In fact it's the sixth. Other comets, including Borrelly, Tempel 1, Wild 2 and the true cometary superstar  Halley  have all been approached by ships. But Deep Impact is special, and not just because of the extraordinarily crisp images it has returned. The ship was not originally intended to visit Hartley 2 at all. Instead, its prime target was Tempel 1, which it reached in July 2005 after its launch. Once there, it fired what amounted to a cosmic cannonball into the comet's core, then analyzed the plume of ice and other debris that flew up into space. When the last stream of data had been transmitted home, the mission was done, but the spacecraft was still fit. Mission directors thus decided to point its prow another way and send it off for an encounter with comet Boethin in 2008. Nice plan, but by 2007, Boethin was nowhere to be found  scientists speculated that it disintegrated  so NASA aimed farther, for Hartley 2 instead. "We went to our backup," said project manager Tom Duxbury at the time the decision was made, "which is every bit as interesting, but about two years farther down the road." It was worth the wait, though it took some pinpoint piloting to get there. Hartley 2 is a peanut-shaped rock only 1.4 miles (2.2 km) long  about one-seventh the size of the target Tempel 1 presented. What's more, it rarely holds still. 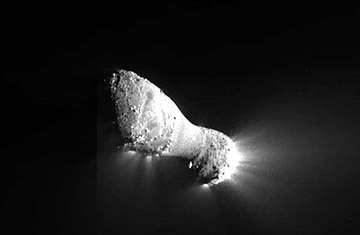 A comet's signature tail is the result of volatile materials like water streaming away from the nucleus as it approaches the heat and light of the sun. Small comets may have small plumes caused by ice deposits at various points on their surface, and that can make things awfully unstable. "These jets can act as thrusters and actually make small changes to the comet's orbit around the sun," said principal investigator Mike A'Hearn. That required a final 6.8-sec. burn of the spacecraft's engines on Tuesday to refine the trajectory and change its speed by just 3 m.p.h. (5 km/h). Whether the scientists could pull things off just right was never a sure thing. "I have never seen a comet flit around the sky like this one," said a relieved mission navigator, Shyam Bhaskaran, after the burn was completed successfully. Even then, the closest encounter between spacecraft and comet, which occurred at about 10 a.m. E.T. Thursday, was 435 miles (700 km). On a cosmic scale, however, that's just a whisker, and the pictures, captured by two long-range cameras, suggest just such a proximity. On any scale, the visit was fleeting, with the ship moving at 27,000 m.p.h. (43,000 km/h). In the brief time the two bodies approached each other, however, the ship fired roughly 118,000 pictures. All of those images and other data will next be studied at the leisurely pace possible when the critical parts of a mission are done. Meantime, the comet will resume its ancient journey, and Deep Impact its still very young one. Both could survive in the skies for as long as the solar system itself exists. Read "NASA Spaceship Captures Images of a Bizarre Comet." See pictures of Earth from space. See pictures of five nations' space programs.